Everything You Need To Know About Meezan Internet Banking…! Banks are more important for a person to keep his/her money safe and secure for long time. We all kept our savings in banks by opening our banks accounts. It seems too much difficult to go in bank and stand in a long queue and waiting for our turn. Meezan Bank Limited make it easier for us by Meezan Internet Banking. Now we can make our transactions online in sitting our home or in office. Now it is possible to make online transaction from anywhere and at any time via Meezan Internet Banking. You can perform all your transactions online such as bill payment, funds transfer etc. whenever and wherever you want to. Here are the complete information about Meezan Internet Banking. This is the main page of Meezan Internet Banking. Here you can login by entering your username and password if you have registered earlier. If you don’t have an account on Meezan Internet Banking then firstly you need to register yourself just following simple steps. If you have no account then click on Register for Internet Banking. After clicking on this link the following page would be opened. Here you need to enter 16 Digit Debit Card Number. Then enter your ATM PIN. Enter your CNIC or Passport or NICOP anyone that you have. At last point you need to enter 14 Digit Account Number for registration. Click on Accept Terms and Continue for further processing. 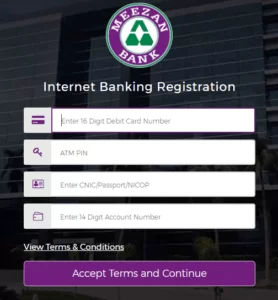 Meezan Internet Banking is a device friendly service it means it can be used on computer, telephone, personal digital assistant and or electronic device. You can recover your password in case of forgotten your password. High security features are added in this service so you can believe it. You can view and check all your transactions details and receipts. There is also Due Date Visibility, Card Management and Security Images for users of Meezan Internet Banking Service. Meezan Bank Limited offers the personal banking for its users. The people can open any account given in below list for their choice. These accounts are for local and foreign currency. You can open four different types of current accounts with Meezan Bank Limited. These current accounts are available in local and foreign currency with Safe, Secure, and Stable manner. You can open four different types of savings accounts in Meezan Bank. These saving accounts are available in local and foreign currency through “Truly Halal Savings”. Meezan Bank offers four unique types of special savings accounts to suit your various requirements. These accounts are “For your Diverse Savings Needs”. You can open two types of asaan accounts both in local currency. These accounts are making your “Banking at its Simplest”. You can open two types of Express accounts to “Facilitate the Beneficiaries of Home Remittance”. Now you can transfer funds to other bank accounts instantly through Meezan Internet banking. This facility is already available at nationwide network of Meezan ATMs. Now it is possible to transfer your funds and money to other bank accounts when you want.